Australia have called George Smith, Jesse Mogg and Ben Tapuai into camp ahead of the second Tom Richards Cup Test against the British & Irish Lions at Etihad Stadium in Melbourne on Saturday. The reinforcements was called for after the injuries that have placed in doubt inside centre Pat McCabe (neck), winger Digby Ioane (shoulder), centre Adam Ashley-Cooper (shoulder) and fullback Berrick Barnes (head knock). All four players were sent for scans after the first Test in Brisbane, with their selection prospects for the second Test against the Lions to be determined in the early part of the week. The status of inside centre Christian Lealiifano, who left the field at Suncorp Stadium after a glancing blow to the head in the opening minute of the first Test, will also be reviewed further once the Wallabies settle in Melbourne. Tapuai, 24, is comfortable at both inside and outside centre and has played seven Tests for the Wallabies - six in 2012 - since making his debut against Wales on the 2011 Spring Tour. He last appeared for Australia on the 2012 Spring Tour of Europe. Mogg is uncapped, but he was involved in the Wallabies preliminary squad last year after a rookie Super Rugby season that saw him appear in all but two of the Brumbies' matches. The fullback, who turned 24 in early June, has again been a standout this term, helping the Brumbies to the top of the Australian conference and featuring prominently in the side that defeated the midweek Lions team in Canberra. 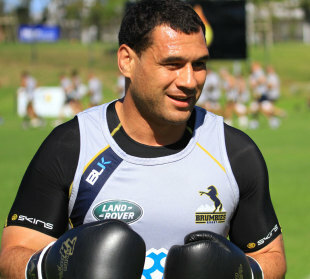 Smith, 32, who returned to Australia this year on a short-term contract with the Brumbies, won the last of his 110 caps when the Wallabies defeated Wales 33-12 at Millennium Stadium, Cardiff, in 2009. He is based with Japanese club Suntory, but gained Australian Rugby Union clearance to play against the Lions for the second time after extending his contract with the Brumbies through to the end of the Super Rugby competition. A knee injury sustained during the Brumbies' loss to New South Wales Waratahs in Sydney in May put on hold his Test hopes while he underwent rehabilitation, but Smith is back running and ready for a fitness assessment by Wallabies staff.